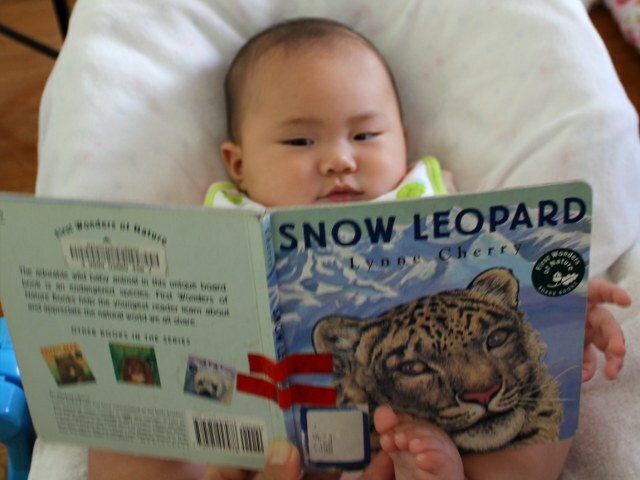 Arya likes looking at books with animal pictures so the front cover of Snow Leopard by Lynne Cherry stood out as a promising choice. The leopard stares out from the cover with oddly-realistic yellow eyes. Arya really liked the snow leopard and kept slapping his face when we were preparing to read the book. Snow Leopard is a surprisingly realistic portrayal of the lives of snow leopards in their cold mountain home. Cherry uses all 14 pages to show the leopards surrounded by snow and rocks. Unlike other children’s books, Snow Leopard uses realistic illustrations that display the animals exactly as they look in real life. Some of the images–particularly when the leopards are displaying their fangs in a yawn and staring at the reader while preparing to hunt–may be a little too realistic for scared, young readers. Text is limited to short sentences with less than ten words per page. Simple vocabulary and predominantly monosyllabic words make the book a good choice for early readers to tackle by themselves. Background images have a consistent feel of cold and sparse wilderness. The leopards themselves serve as a focal point with their spotted coats despite the fact their coats blend into the snow-covered rocks. Young children who are interested in animals will love looking at the big cats in their natural environment. Arya didn’t like the book as much as some other children’s books with more colorful pictures. She did enjoy touching the leopards, but the limited variety of backgrounds and repeated presentation of the leopards made my baby lose attention over time. Snow Leopard is probably better suited for toddlers who enjoy looking at animals or school-age kids who have seen real leopards in a zoo. Snow Leopard is currently out of print, but used copies are available for under $5 (including shipping) from Amazon.